"Kinesis," when defined as simply as possible, means "movement." When the definition is expanded, or given a biological reading, it references the idea of movement that takes place in response to external stimuli. 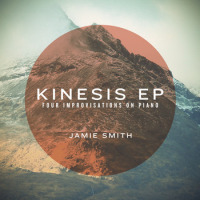 Without knowing the circumstances surrounding the recording of this oh-so-brief solo piano EP, it's hard to know which one Scottish pianist Jamie Smith is citing in the title, but it's irrelevant. Smith's music, whether influenced by external or internal forces, is ever-mobile. This five track EP, with a running time of approximately twenty-one minutes, seems to end before it even begins, but Smith deserves credit, not scorn, for valuing brevity and concision; if he can say what he wants in such a brief time span, more power to him. All four pieces are wholly improvised, but not all of them come off that way. "Undercurrent," for example displays certain structural logic. Smith plays on the idea of stability with slight variations, toying with a single motif at times, but he seems to know just when and how to break things up, as he alters his stride a bit and pulls back. This piece may be an on-the-spot creation, but it still sounds like a thought- out number. "Kinetic," on the other hand, does not. That number, which opens up the EP, comes off as a stream-of-consciousness run between two hands. It's not disorderly, dissonant or inaccessible, but it's also not clear in its direction. "Channelling" breaks away in a different direction. It's a NOLA-infused, high-spirited number that's bluesy and churchy in nature. A simple-and-repetitive left hand bass line, with slight tweaks, carries through a good portion of the piece, and Smith romps along with glee. "Release," which officially closes out the EP, is a bit more probing and graceful, as Smith balances semi-rhapsodic tendencies with more matter-of-fact passages. The bonus track"WKG"doesn't really say much that hasn't already been said. Kinesis isn't based on tradition, it's not driven by any single ideal, and it's not nearly as left-leaning as most wholly improvised recitals. It's simply a snapshot of a man having a good time making music that's mostly interesting to behold. Track Listing: Kinetic; Undercurrent; Channelling; Release; WKG (Bonus Track).